Features Manager, among other things, is required to consult with the restaurant owners with regard to maintenance of books and records, statement preparation, working capital and financial controls. Also, the manager is to assist the restaurant with management and reporting systems for food and beverage operations, as well as to assist restaurant with screening of personnel for cashier positions. THIS AGREEMENT (“Agreement”), made as of __________, 20__ is by and between Good Food Restaurant, LLC, a __________ limited liability company (“Restaurant”) and FOOD SERVICE FINANCIAL MANAGEMENT, a __________ corporation (“Manager”). Restaurant is the tenants of that certain leasehold restaurant property located in __________, __________ (the “Property') and known as Good Food Restaurant, located at (“Restaurant”). Manager desires to be engaged to provide accounting and cash management controls and services to Restaurant under the terms and conditions herein contained. 1.1 Engagement as Manager. Restaurant hereby engages the Manager as an independent contractor to provide the services described herein and Manager hereby accepts such engagement, all on the terms and conditions and subject to the limitations and restrictions hereinafter provided. Manager shall consult with Restaurant in areas of maintenance of books and records, statement preparation and implementation of Restaurant's working capital requirements and controls. In addition, Manager will consult with Restaurant concerning matters of payroll administration and insurance coverage. 2.2 At the request of Restaurant, Manager shall also assist in the implementation of Restaurant's food and beverage management and reporting procedures and systems for a reasonable period following such appointment. 2.3 At the request of Restaurant, Manager shall assist with the screening of qualified personnel to serve as cashiers for the Restaurant when such cashiers are being hired by Restaurant. 3.1 Manager's agents and employees shall at all times, while upon the premises of Restaurant and while engaged in the performance of any provisions of this Agreement, conduct themselves in a proper and professional manner and refrain from any conduct detrimental to Restaurant or which might subject Restaurant to criticism. 3.2 Compensation for Management. The compensation that Manager shall be entitled to receive for services performed as Manager under this Agreement shall be a fee payable in arrears on the first day of each month commencing on the effective date of this Agreement, in an amount equal to $_______________. 3.3 Term. This Agreement shall commence as of the date first set forth above and shall thereafter continue for a period until the expiration of the Restaurant's lease at the Property. Upon a sale of the Restaurant to a third party or the sale of the assets of Restaurant to a third party, Restaurant may terminate this Agreement by giving the Manager thirty (30) days prior written notice. Upon termination of this Agreement under this Section 3.3, Manager shall be entitled to receive any management fees already accrued and due to manager under this Agreement, but shall not be entitled to any termination fee or other compensation. 3.4 Assignment. 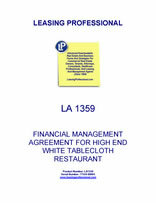 Restaurant may assign its rights and obligations to any successor in the title to the Property (i.e., its leasehold interest) and upon such assignment shall be relieved of all liability accruing under this Agreement after the effective date of such assignment and the assumption by assignee of the obligations of Restaurant. Upon any such assignment by Restaurant, Manager shall have the right to terminate this Agreement after thirty (30) days prior written notice to assignee and to Restaurant. Manager may not assign its obligations hereunder, without the express prior written consent of Restaurant except for an assignment to an entity which is controlled by Manager and only after such assignee has assumed the obligations of Manager hereunder. 3.6 Indemnification by Manager. Manager shall indemnify and hold Restaurant harmless from and against any and all liability, losses, damages, claims, causes of action, and expenses, including reasonable attorney’s fees, associated with or directly or indirectly resulting from any intentional act or omission of Manager or the personnel under its supervision. To be entitled to such indemnification, Restaurant shall give Manager prompt written notice of the assertion by a third party of any claim with respect to which Restaurant might bring a claim for indemnification hereunder, and in all events must provide such written notice to Manager within the applicable period for defense of such claim by Manager. Manager shall have the right to defend and litigate any such third-party claim.